File folder games are perfect for independent skill practice and can easily fold up to be stored away when not used. I really like the ones from Oriental Trading because they are a lot more colorful and MUCH sturdier than the manila ones that I usually use to file away papers. File folder games usually consist of a game board, cards, manipulatives, envelopes, ziplock bags, directions for the game and to put the file folder together you will want to have on hand a lamintor, glue stick, spray adhesive, scissors and clear tape. I also like velcro dots if you want to make sure your manipulatives stay in place and are less likely to get lost but it is an extra cost and it is ok to cut it out. To make a file folder game, first think of the skill that you would like your students to practice independently. For example, in this blog post I am going to walk you through a game that I am going to create. This will be the design process that I usually use for most resources that I create. 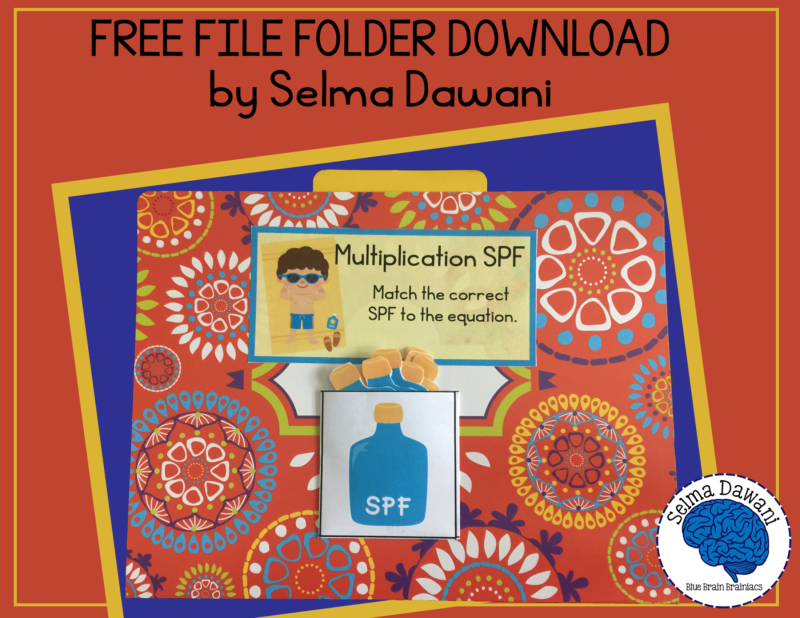 The file folder game that I will use as an example will be one that I call “Multiplication SPF” and the skill I will have students focus on is practicing their multiplication facts. When designing a file folder game, the most important point is deciding the skill and how you want it to be practiced and simplify your idea as much as possible because file folders are meant to be used independently. After deciding what concept or skill you would like to cover, think about the theme, holiday, or season you would like to brainstorm so that you can find appropriate clip art and come up with the game. In this case, I want to make a summer fun multiplication game, I didn’t think up the name until I decided which clip art and design I wanted to use. I have included my brainstorming sheet so that you can see my thinking to create this game. I decided to make a simple match game but really with file folders the possibilities are endless. It is all up to your imagination. I decided to use the sun and a suntan lotion duo. I would have liked to use a pail and shovel but I didn’t have any clip art I liked so I stuck with the sun and lotion. I like how it turned out. To actually design my resources, I use Adobe’s creative cloud – I am not an expert but I used Indesign and Photoshop to create the pieces of this file folder game. To assemble the file folder game, first start by printing everything out. I print the sun equations out on cardstock but I am only laminating the suntan lotion bottles and carefully cutting them out. Just a quick tip, I use spray adhesive to attach the board game to the folder and it got everywhere – the best way to get spray adhesive off of your hands and desk is with GOO BE GONE! Miracle! Then I assemble and attach the directions and folder that will hold the lotion bottles. Easy peasy and the kids will love it! Great for an independent June math center. I really like folder games and I KNOW kids love to use them. I also created a “Multiplication SPF” Recording Sheet so your students can record their answers. I know this one takes a bit of effort to assemble but it will last you many years and the benefits yours students have from practicing their multiplication facts will be well worth it. I hope you really liked this blog post. Help out other teachers, homeschoolers and “afterschooling” parents find this resource by pinning the image below. Thank you so much! If you need more resources to teach multiplication, please check out my beginning multiplication unit and my multiplication fact memorization program.